Within the Yungdrung Bön religious tradition, there is the custom of lamas giving their disciples so called “protection cords.” The Tibetan name, sung dü [Tib. bsrung mdud], literally translates as “knot of protection”. This refers to the special knot at the center of the string, or strip of material, that holds the protection. The string, or strip of material, can be of any of the five colors: white, green, red, blue, or yellow. It can also be of all five together. However, some practices specify the use of a particular color for the construction of a protection cord. 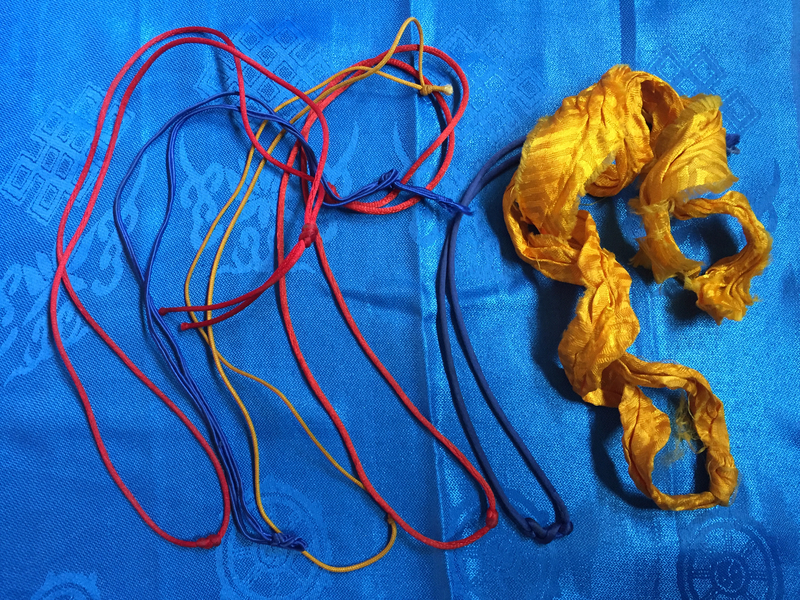 For example, at the conclusion of the seven-day longevity retreat of Lama Tséwang Rikdzin, the text instructs the practitioner to create a sung dü using a white cord or string, and tying twenty-one of the special knots together with the recitation of the longevity mantra of Khandro Tukjé Kündrol. 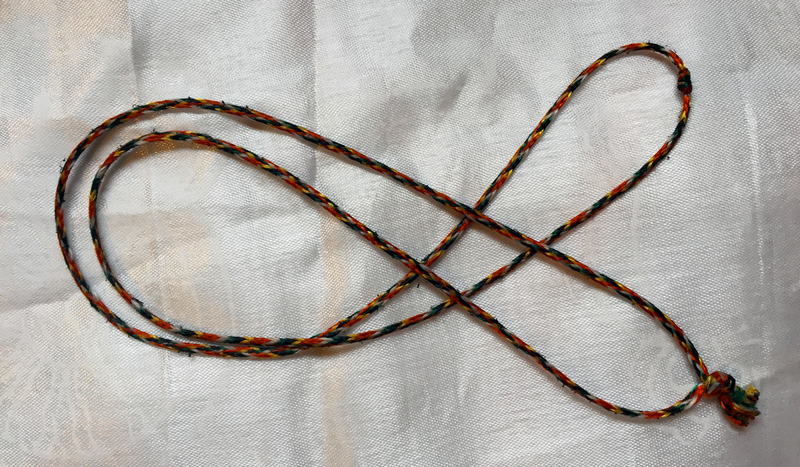 Protection cord of the five colors of the elements. Photo credit: Raven Cypress Wood. These special square knots are tied as a mantra is blown onto them, and therefore act to hold the blessing and protection of the mantra. They are created only by those who have actually accomplished the power of the mantra through extensive practice according to the scriptures. These knots should never be opened. These sung dü are most often worn around the neck, or placed in a ga’u, or special locket. The area of the body above the waist is considered higher and more respectful than the area below the waist. Therefore, keeping a blessing cord in a pocket below the waist is not ideal. Sometimes, they are worn on the wrist, but there should be mindfulness to keep the protection cord uncontaminated. 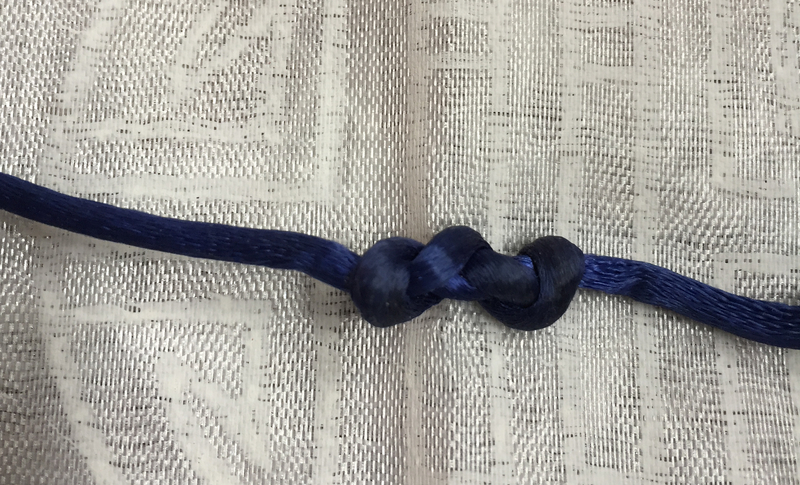 Upon receiving a protection cord, it should be worn for at least three nights. After that, it can continue to be worn, placed in a respectful and sacred place such as a shrine, or burned as a respectful method of disposal. As with any sacred object, it should be kept off the floor or other unclean places. It should never be thrown in the trash or mindlessly discarded. Posted on July 14, 2018, in Uncategorized. Bookmark the permalink. Leave a comment.